The shift to a cloud platform gave Boeing 100x times faster infrastructure service delivery and a 6x increase in asset utilization. With a view to stay competitive on the market and survive another 100 years, Boeing adopted Cloud Foundry—lying at the core of its Digital Transformation Environment (DTE). 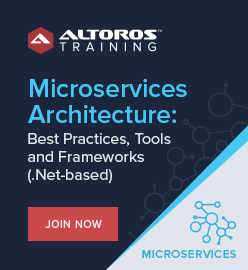 A microservices model enables flexible, independently deployable systems. Digital transformation should be an ongoing goal. External partnerships are essential in providing additional support and advocacy while adopting a new technology. Boeing was founded in 1916 with its headquarters now located in Chicago. It is one of the largest aerospace companies in the world with about 150,000 employees in over 65 countries. The leading manufacturer of commercial jetliners, as well as defense, space, and security systems has over 20,000 contracts with suppliers and partners globally. Boeing reported $94.6 billion in revenues for 2016. In 2017, Boeing set the industry record for the most commercial airplane deliveries with 763 orders completed. This was also the sixth consecutive year that the company delivered more than any other airplane manufacturer. Boeing celebrated its 100-year anniversary in 2016. Being a pioneer in many aspects of the aerospace industry, the aircraft manufacturer can now boast that its 7-series family of airplanes dominates commercial flights. Furthermore, Boeing is a major service provider to NASA. To get an understanding of what a colossus Boeing is, one can rely on the figures provided by Kenneth Swope at the PDT Europe 2017 conference. The company has around 3,400 processes with 4,100 applications on 5,100 servers using 14,000 integrations. These are affected by 900 changes annually, impacting over 100,000 users with 12 copies of the data. Boeing stores more than 20 petabytes of data across seven countries. With intent to survive another 100 years, Boeing recognized the need to digitally transform if it wanted to retain its positions as a market leader. 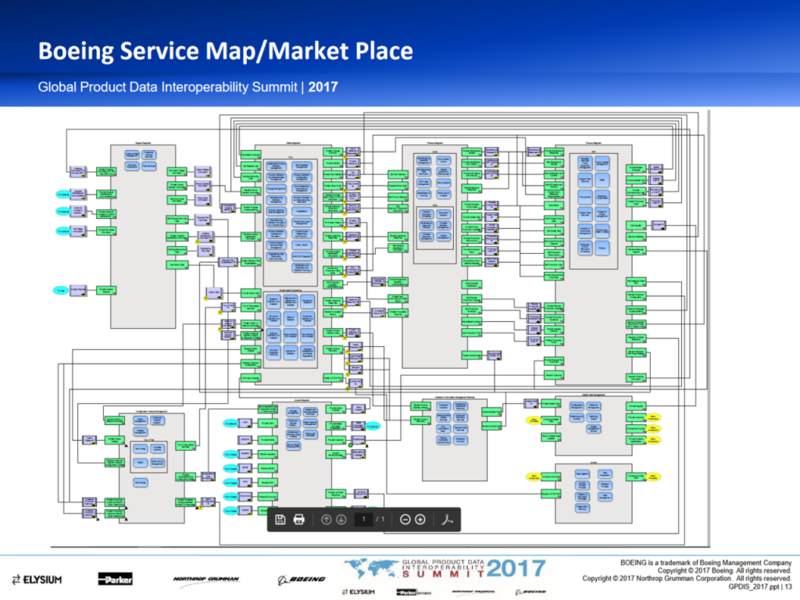 This meant the company needed to widen the span of system engineering, simulation, and prediction to cover each stage of the product life cycle—as outlined by David Bernert, IT and Data Analytics Chief Architect for Boeing, at the GPDIS 2017 forum. Niki Allen of Boeing backed up this idea at the SpringOne Platform conference held in December 2017. “Just the proliferation of sensors alone has changed the way we collect, process, analyze, and decimate data,” she said. “Multiply that across our entire fleet and install base, and that is a lot of data, but there’s value in that data.” According to Niki, a 787 Dreamliner alone will generate about a terabyte of data in a single flight. To pursue its goal of digital evolution, Boeing had to adopt a new technology that will serve as a business transformation catalyst. “We have to create our own digital factory that we can use as an accelerant to help lead us through this transformation,” emphasized Niki. The accelerant could be a platform that would serve as a mainstay for distribution of data, processes, and infrastructure in a way that drives innovation. The accelerator would need to be secure, which meant the inclusion of virus protection, security controls, and multi-factor authentication. As Niki noted, a company like Boeing wasn’t born digital, there was a host of complexity, legacy systems, architecture, point-to-point integrations, etc. that had to be addressed by the accelerator. In October 2016, Boeing came up with an initiative to create the Digital Transformation Environment (DTE). 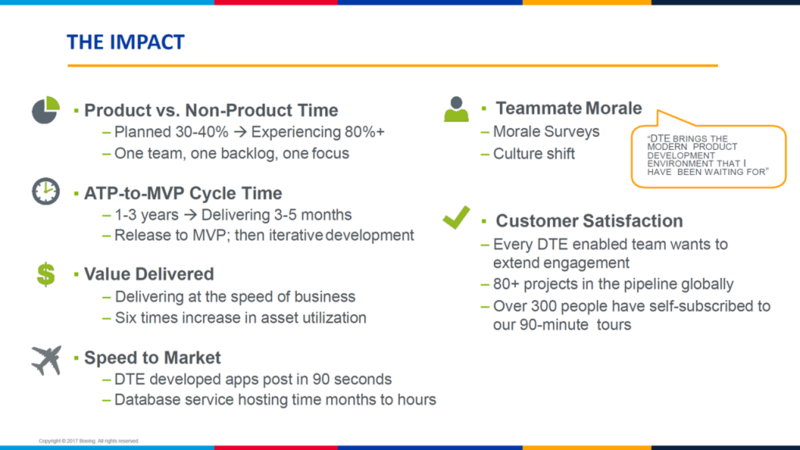 The building blocks behind DTE comprised infrastructure and a comprehensive technology stack to build innovative services, as well as a project management office to established seamless processes. The initiative was approved by Boeing’s IT Finance Competitive Assessment Group in November 2016, given strategic priority, and the first investment request went through the new process. DTE also had a 5-year projection plan and analysis, which included the benefits of licensing, sourced labor, and compute resources, as well as IT labor productivity savings. 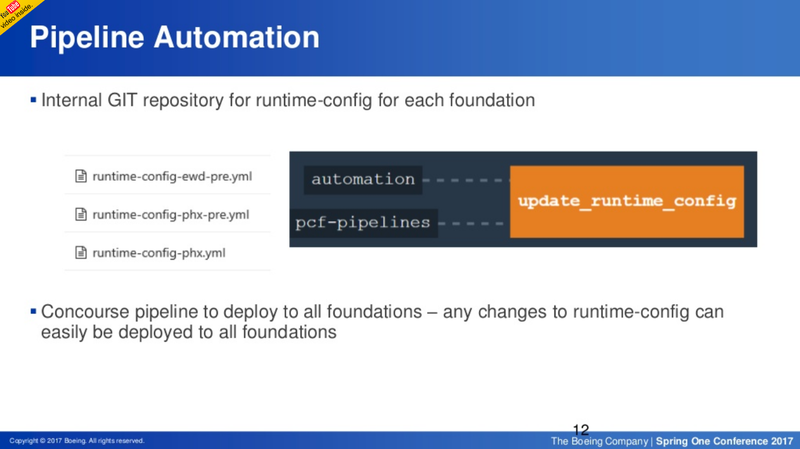 Underlying DTE as a technology core, Cloud Foundry was chosen to accelerate development and delivery. 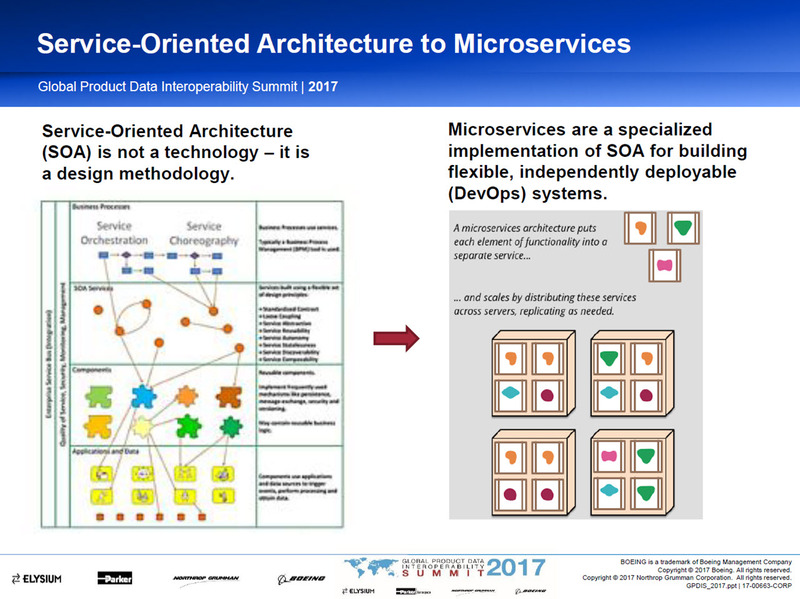 Within the DTE initiative, Boeing also wanted to shift its service-oriented architecture (SOA) towards the microservices approach. This was necessary for building flexible, independently deployable systems, as well as for efficient scaling over time. Such a move from a SOA-based model would help to faster innovate and fail, get rid of stagnant concepts, while retaining those that maximize value. With the Cloud Foundry adoption in motion, the next step was to make sure everything would remain secure. James Coppock, Cloud Specialist at Boeing, detailed how the initial security concerns were addressed in a dojo, where the team worked alongside people from Pivotal, Stark & Wayne, and Altoros. 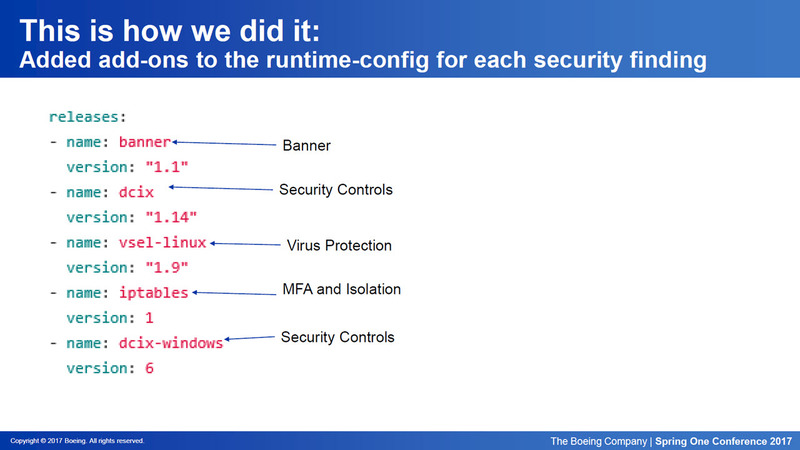 For virus protection, developers at Boeing utilized the McAfee’s antivirus program. “We had a corporate image of Windows Server 2012 R2,” noted James. “That image already comes with McAfee.” According to James, McAfee was scanning the VCAP folders, which prevented Diego cells from building. Exclusions had to be set to resolve the problem. Similarly, just like the compliance client, the virus scanner had issues connecting outside the network and to the McAfee ePolicy Orchestrator. This was also fixed using the same API. Lastly, the team employed host-based firewalls to restrict direct access and to isolate internal servers. While setting up the security, engineers figured out how to enable fine-grained filtering with runtime-config by excluding classes of systems. 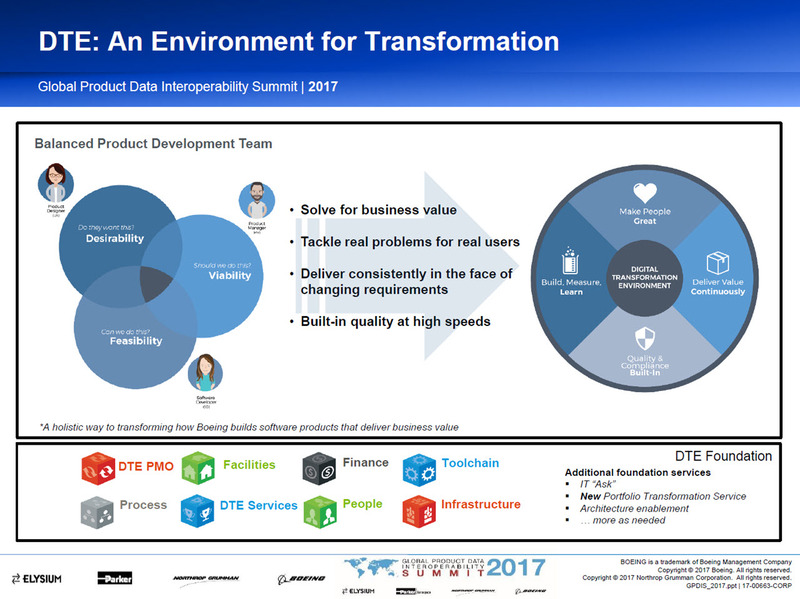 More value delivered by the DTE, as David Bernert mentioned, included the release of an avionics tool and automation of the toolchain and the Cloud Foundry platform end-to-end. In addition, Boeing moved to a user-centric approach, which allowed the company’s IT teams to be in tune with the business requirements. 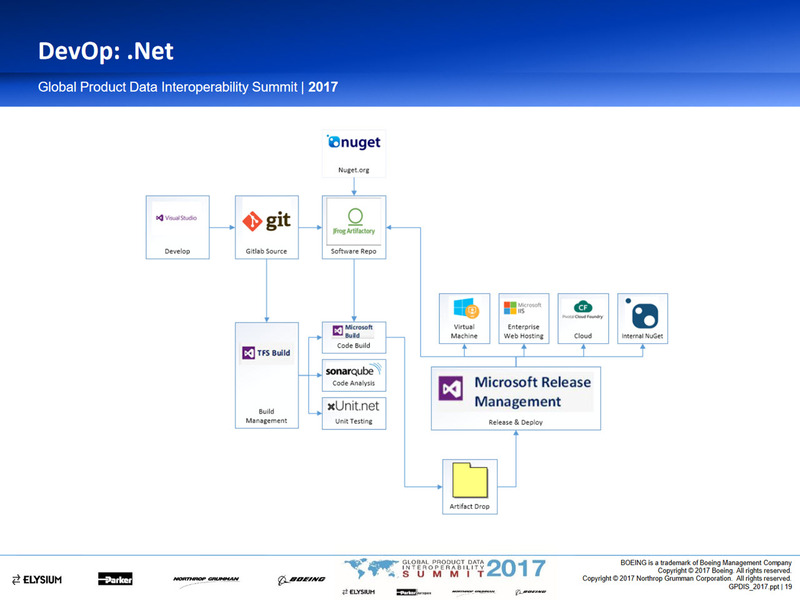 The adoption of the cloud and open source software has also enabled Boeing to save on the cost of operations and licensing. Ted Colbert, the company’s CIO, did a podcast on digital transformation. According to him, the strategy is all about “identifying opportunities to create value for business, driving productivity, and leveraging the rest of the organization in a way that drives the transformation.” The shift to the cloud is just one more step for Boeing in realizing this vision. So, the company is actively investing into trending technologies. As we see, the company is persistent in its intention to stay here for another 100 years (or even more) as an innovator and leading service provider. In this video, James Coppock details how his team addressed security concerns with Cloud Foundry. 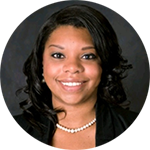 Niki Allen is Executive Director of the Office of the CIO at Boeing. 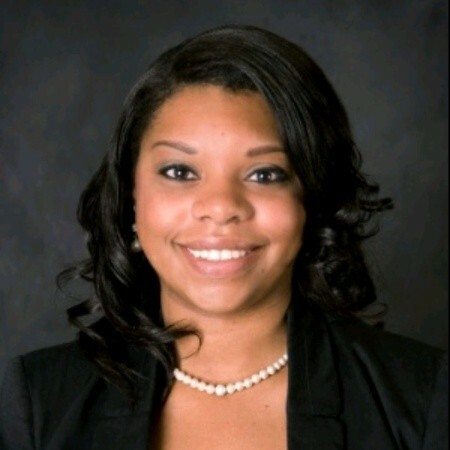 In this role, she serves as the Chief Operating Officer for Boeing’s Information Technology and Data Analytics organization which includes over 6,500 employees. 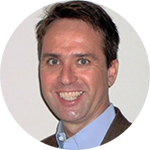 Niki is responsible for strategy alignment and execution, driving and organizational change. She also handles process and procedure management, strategic sourcing, external technical affiliations, and key project leadership. 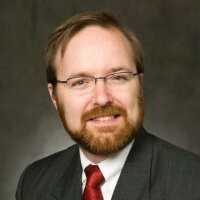 Kenneth Swope is Senior Manager at Boeing. He leads the Business Capability Integration organization at Boeing Commercial Airplanes for Business Architecture and Change. Kenneth started with Boeing in 1994, following his graduation from the University of Missouri with a BS in Mechanical Engineering and BA in Physics from Central Missouri State University. 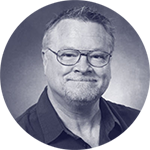 As a manufacturing research engineer, he supported the company’s Wichita facility in manufacturing process improvements and advanced numerical control technologies. David Bernert is IT Chief Architect at Boeing. He leads the company’s initiative around Digital Business Transformation with his teams working on Second Century Enterprise Systems. David is also the Boeing IBM Executive Representative. He joined Boeing after more than 34 years with Hewlett-Packard. 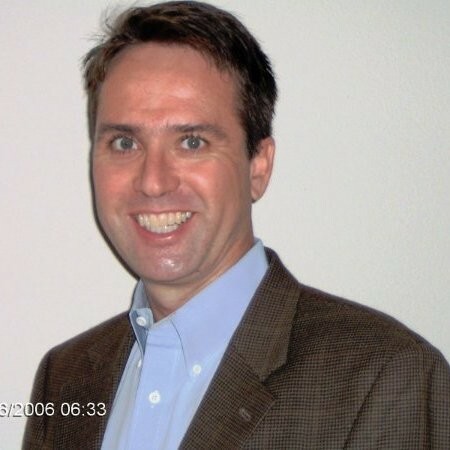 James Coppock is a Cloud Specialist at Boeing. 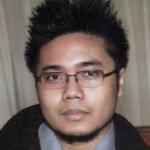 He is actively involved in the organization’s adoption of Cloud Foundry. James has been working in IT for over 20 years. He specializes in Windows and .NET Framework/Core on Pivotal Cloud Foundry. This blog post was written by Carlo Gutierrez, Sophie Turol, and Alex Khizhniak.